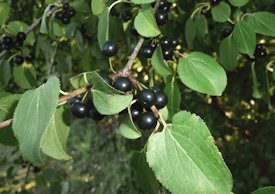 Not currently available in 2019 but Common and Alder Buckthorn whips are quite inexpensive to buy from nurseries. The objective of this project is to increase the number of Brimsone butterflies breeding in Suffolk, especially in the east of the county. 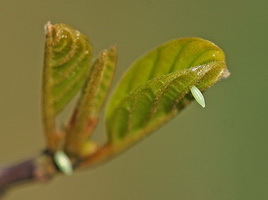 Previously (see History below) over 4000 Common and Alder Buckthorn bushes, the foodplant of the caterpillars, were planted in Suffolk, mostly in gardens. But we need your help to further our efforts, particularly if you live in an area where there have been few sightings of Brimstones. For 2018 we have identified new areas that have not previously been incorporated into the Brimstones & Buckthorns Project. If we can count on your support, the Suffolk Branch of Butterfly Conservation will provide you with FREE plants. These will be bare rooted whips of both Common and Alder Buckthorn. 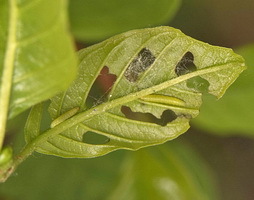 The Brimstone will lay their eggs on these, the plants providing the foodplant for the caterpillars. Although it may take a couple of years for the bushes to establish and attract Brimstones, it will be worth the wait due to the Brimstone's legendary ability to find the bush from afar. You will be making a valuable contribution to the preservation of this Butterfly, at a time when numbers of all species in the UK continue to fall. - Encourage local people to report their Brimstone sightings. The most valuable part of the project will be the ongoing recording of sightings in your area. This can be done by sending them to the e-mail contacts below. View new Brimstones map in a larger map. This will display in a new tab. Scroll to the bottom of the left pane (the list of entries) and click on 3 to see a larger scale. 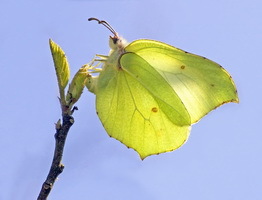 In 1998 Julian Dowding spearheaded the Brimstones and Buckthorn project with Suffolk Branch of Butterfly Conservation, Ipswich Organic Gardeners Group, Ipswich Wildlife Group and the Wildlife Rangers at Ipswich Borough Council. 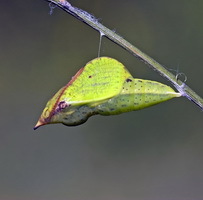 The project was based upon the fact that female Brimstone butterflies are very good at finding their caterpillar food plant Buckthorn on which to lay eggs, from afar. 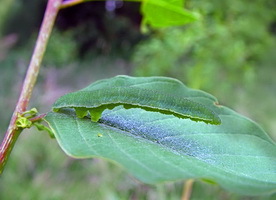 In just two years, over 2000 bushes of both Common Buckthorn Rhamnus cathartica and Alder Buckthorn Frangula alnus were planted in the target area, and female Brimstones soon homed in with the first one turning up during fine sunny weather at a home in Bildeston on May Day, 1999. 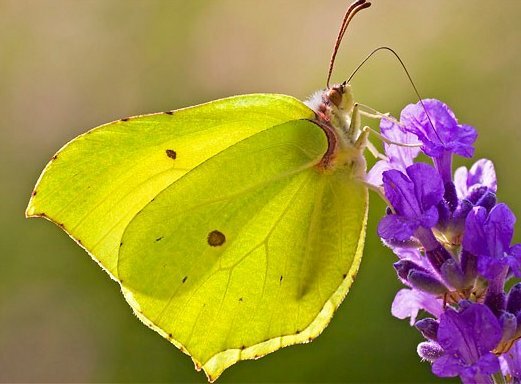 The initiative aimed at getting people involved in growing Buckthorn bushes to attract breeding Brimstone butterflies which were scarce in the East of the county of Suffolk and was a wildlife gardening exercise. Today the butterfly is much more common in parts of Suffolk, due to these efforts. In 2011, Matt Berry and Julian Dowding along with Suffolk Branch of Butterfly Conservation rolled out Brimstones and Buckthorn once again. 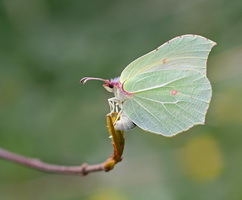 The aim to increase both the range and number of Brimstones seen in the parts of Suffolk, where the butterfly continues to be elusive, whilst at the same time getting more people involved in wildlife gardening and in caring for the wider environment. Records of new sightings will be forwarded to the Suffolk Biological Records Office. In April 2011, we launched the campaign at Jimmy Doherty's Farm along with Steve Backshall, from TV's 'Deadly 60', during the opening of Jimmy's butterfly house. Jimmy, Steve and Rob Parker, then Suffolk County Recorder for butterflies, planted three buckthorns in Jimmy's wildlife garden. It was great to have around 75 people and 3 schools sign up to Brimstones and Buckthorn, and moreover, to see literally hundreds of children and parents enthralled by both Jimmy and Steve captivating appeal to get involved with insects and wildlife. Although it may again take a couple of years for the bushes to attract Brimstones, we are sure that it will be worth the wait and have a certain expectation this time around, due to the Brimstone's proven ability to find the bush.